Treffynnon is an 18th century stone built L shaped single story cottage with roses and honeysuckle climbing the walls. The rooms are spacious with central heating. There is a patio area at the front with table, chairs and BBQ and a private garden at the back. There is plenty of parking. The front door leads into the hall and the stone walled corridors that lead to the living rooms to the right and the bedrooms to the left. Bedroom 3: four poster double bed, original stone wall and exposed beams. 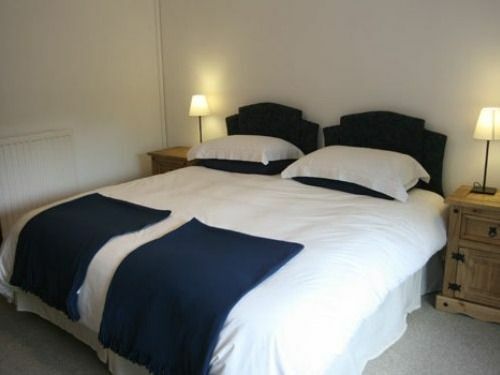 All bedrooms have large fitted wardrobes, are fully carpeted and have quality furnishings. The windows look out onto a large expanse of grass where you can frequently watch pheasants, ducks, squirrels, foxes etc wandering around. A cot and high chair are available at a cost of £10 per stay. The spacious well equipped kitchen is fitted with oak units. There is an electric cooker, microwave, dishwasher etc - also a small table and chairs. Leading off is a small utility room with fridge/freezer and washing machine, iron etc. Both rooms have ceramic tiled floors. There is also a good supply of cleaning materials i.e. Persil, Fairy Liquid etc, also foil, clingfilm, salt, pepper. Bathroom 1 has a free standing bath, basin and WC. Treat yourself to a soak - the wine will be in the fridge and the candles are on the window sill. Bathroom 2 has bath with over bath shower, basin and WC. Both bathrooms have ceramic tiled walls and floors. There are also candles, loo rolls, soap, handwash, shower gel, bath soak and tissues supplied. The dining room has exposed beams and fitted carpet. The oak table will seat 6 to 8 comfortably. The sitting room has exposed beams, the original stone walls and fireplace with basket of logs (fire lighters and matches also supplied), fitted carpet, two large comfy sofas with plenty of cushions, TV, DVD, books, magazines and maps. Cowbridge and the Vale is a land of delightful contrasts, from stunning shores to deep wooded river valleys to wide open moorland or rolling countryside dotted with picturesque villages. Historically, there is much to offer. Cowbridge boasts a rare Physic Garden which attracts many visitors throughout the year. Castles, historic buildings and trails are in abundance. Lakes, rivers, sea and sand . . .